Hugo finished playgroup. Every Friday for two years we've been going to play, make craft, eat warm bread and see puppet shows. It's something we've both enjoyed in our week. For our last day, each child was presented with a tiny red present:: a tiny crochet brooch. He is so proud of it and hasn't taken it off. Such a small handmade gesture means the world to children. Something I'm mindful of in the lead up to Christmas. Next year, he moves up to pre kinder and for one day a week I. Leave. Him. There. All. Day. He can't wait. Sob. 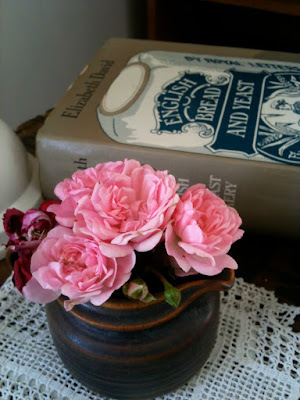 Meanwhile, Elsa has been filling the house with small vases of flowers from the garden. This little bunch was waiting for me on my bedside table last night after returning home from a late shift at work. So sweet. I felt very special as I feel asleep. We also have a guest, he doesn't say much, and we're not sure what he likes to eat, but Elsa has made up a lovely house for him. He brings a gorgeous festive sheen to the house. We hope he likes it here. These are some of the precious moments from our week. I'm trying to focus and remember them and forget about the crazy chaos that takes up most of my time. I hope you've had some precious times in your week too. Hi Michelle - that insect in Elsa's hand is what we kids (when we lived in the Huon in the 50's and 60's) called a Christmas beetle. I haven't a clue if that is actually an official name, or just something we made up, as they were only seen round Christmas, but that's what we called them. Oh I havent seen one of those Christmas beetles in a very long time. You can also get bright green ones too which look magnificent. Your very lucky to have one as a pet but Im not sure what they eat. 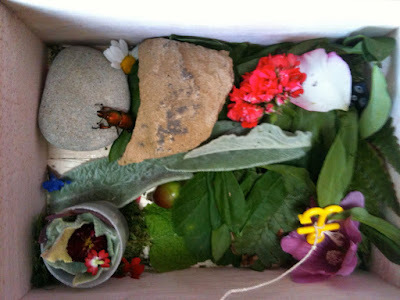 What a sweet beetle house. Next year my oldest goes to school which like Hugo, he is totally up for it. I am feeling a bit sooky about it. this all looks very sweet. precious too. That is one gorgeous beetle house. I love the playgroup brooch. What a lovely idea. I love that whole post. Love it. I have just reread it about 6 times. Its the simple things that really matter. Gorgeous photos too. ps My word verification is calmer!! He's a very smart Christmas beetle-I bet he'd stuggle to find a nicer home! 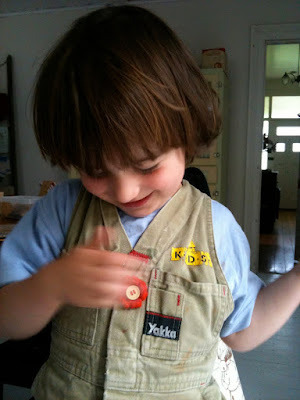 Love Hugo's yakka overalls- so cute! Hope they keep you going through the crazy chaos. Your moments amongst the chaos are lovely Michelle. And what a great idea... to give the playgroup kids a brooch. I love that the boys got brooches too. I can understand your sobs at the thought of next year.